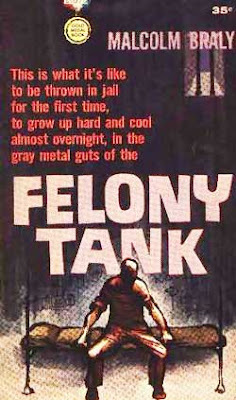 Malcolm Braly's life ironically mirrors his 1961 prison novel “Felony Tank”. Braly was born in Portland in 1925 to the son of an automobile dealer. After that stint fell through, Braly's family hit hard times during the depression. Meaningless robberies eventually stacked up, culminating into multiple sentences in the clinger. While serving time in both Folsom Prison and San Quentin, Braly began to hone his craft – writing books about guys just like himself. Surprisingly, he wrote “Felony Tank” in 1961 behind bars. In fact, Braly went on to write two more in the pen - “Shake Him Till He Rattles” (1963) and “It's Cold Out There” (1966). All were originally released by Gold Medal due to editor Knox Burger convincing Braly to write during a visit to San Quentin. Arguably his best work was “On the Yard”, published in 1967 and adapted to film in 1979. Sadly, after Braly's parole, he only gained 15 years of freedom. He died in an auto accident at age 54. “Felony Tank” follows a hopeless 16-year old named Doug, who in essence is simply Braly reliving his own helter-skelter youth. Doug's childhood and upbringing has led him to become a vagabond, riding the rails and hitchhiking to the next town and the next robbery. After leaving Phoenix, Doug arrives in the southwestern city of Ardilla (state never given). It's here that he commits nearly the same crime as the author – robbing a feed store for a few bucks before picked up by the police. He's taken to jail and placed in an upstairs “penthouse”, an ill-fated mid-point between county jail and prison. Most of the inmates at Ardilla are hardened lifers, they know the drill and are well-aware the next stop is a prison term. The book really becomes interesting with the internal politics. Without ruining it for you, deals are made, cigarettes are exchanged and Doug's cell of no-jobbers has a hacksaw blade. In a daring escape, the second half of the book begins with Doug and his older ruffian/mentor named Agnes on the run. Paralleling one of Braly's own robberies, the duo break into a laundromat to steal clothes (and a suit) and rob a nearby grocery store for what amounts to pennies. After sleeping in abandoned buildings and cars, the two find a warm hostess with stay-at-home mom Marion. While the book possesses a turbulent blend of jail, escape and pursuit, the heart of the book is Doug's struggles with establishing some kind of existence. It's this moment when he meets Marion that really ebbs the tide. Marion is a mother of two, seemingly neglected at home by her husband, a sailor. With Marion's spouse gone for a few weeks, she invites the inexperienced Doug to her bed. He falls in love, but that's just another chapter in what amounts to be a full-circle novel that hopelessly reflects Braly's life behind bars. It had to be incredibly fulfilling, satisfying and all-together victorious for Braly to not only pen his own struggles, but to have a novel published by Gold Medal while in prison. “Felony Tank” is written from the heart on a gravel road of conviction and authenticity. It's a stellar first effort (nominated for an Edgar) and one that cements Braly's position in the “prison drama” niche of novels. While action and adventure fans may be swayed off course, Doug's story is so tragic that it warrants another page flip to see what's coming next. 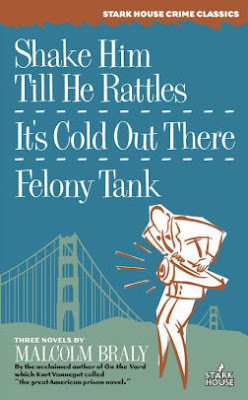 I highly recommend “Felony Tank” and it's available as both a Black Gat Books reprint (2016) or together in a Stark House collection with “Shake Him Till He Rattles/It's Cold Out There” (2016).